We're getting close to the official end of our school year - we only have until the end of May to go! We actually can accumulate hours on the current school year through June 30th, and then the summer hours all flip to the next school year. I waffle each year as to if I put those June hours on the new grade even though they are technically part of the previous school year. In the end, I always decide to tack them to the previous grade and don't officially promote Amber until July 1st. It's just simpler to record it that way. Amber is definitely petering out and feels diminished each day. Thankfully her required school hours are complete and we can be officially finished for the school year if it's needed. The rest of it is all icing. We actually took off Wednesday of this week because I had a dentist appointment. My mom played Pay Day with Amber while I had the last of the old fillings on top replaced before we all went to lunch. That was a somewhat humorous affair considering half of my mouth was still mostly numb. I guess the weaning of Amber's medication is going well considering she hasn't had any withdrawal reactions to lowering the dosage and frequency. However, we will never again doubt the positive effects of fludrocortisone. The massive blood pooling in Amber's legs and feet that result in dark blue / purplely / blackish and swollen toes has returned. It's ever so pretty. She's been feeling fairly sickly all week, but Tuesday was the worst by far. She woke up nauseous and pale. Eventually she recovered to her new baseline over the span of the day, but it was pretty scary in the morning. Mother's Day! Amber's blood pressure was so low that morning that we didn't make church. She was actually sickly all day, but we still had a nice time together. And I didn't have to cook! 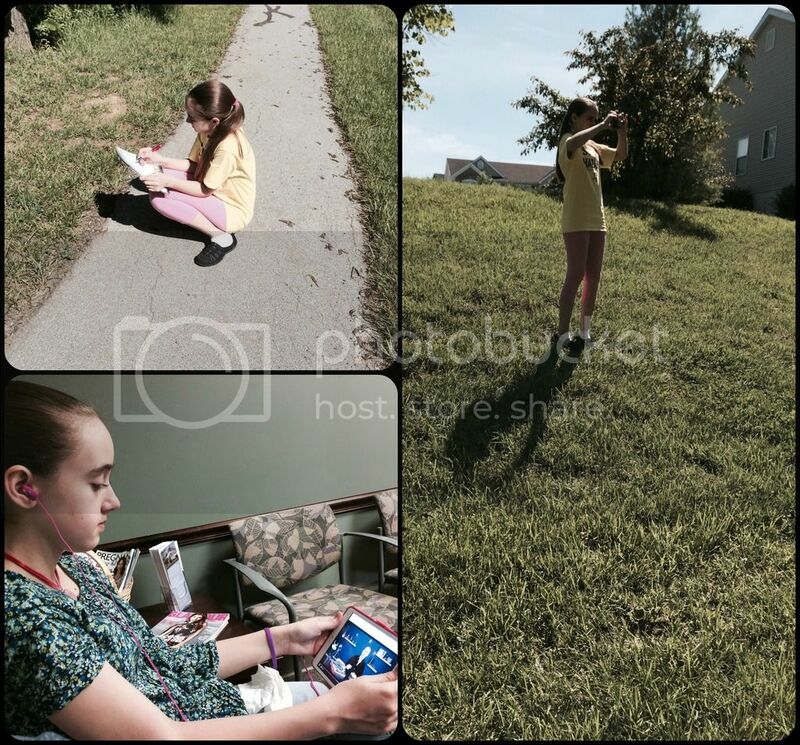 In actual school work this week, we had our very first nature study! I suppose most of us do nature studies without even realizing it when we look at plants, work in the yard, etc. But this was our very first purposeful nature study even though we've always meant to do them. Even more pathetic is the location we chose: it is literally across the street from our house on the other side of the swale where we snow sled. There happens to be a walking path in our subdivision that crosses a small creek and leads to the subdivision next to us. The entrance to the path is across the street from our house. We've never taken this path and generally know only about it's direction and the creek from our neighbors who's yard the creek adjoins. 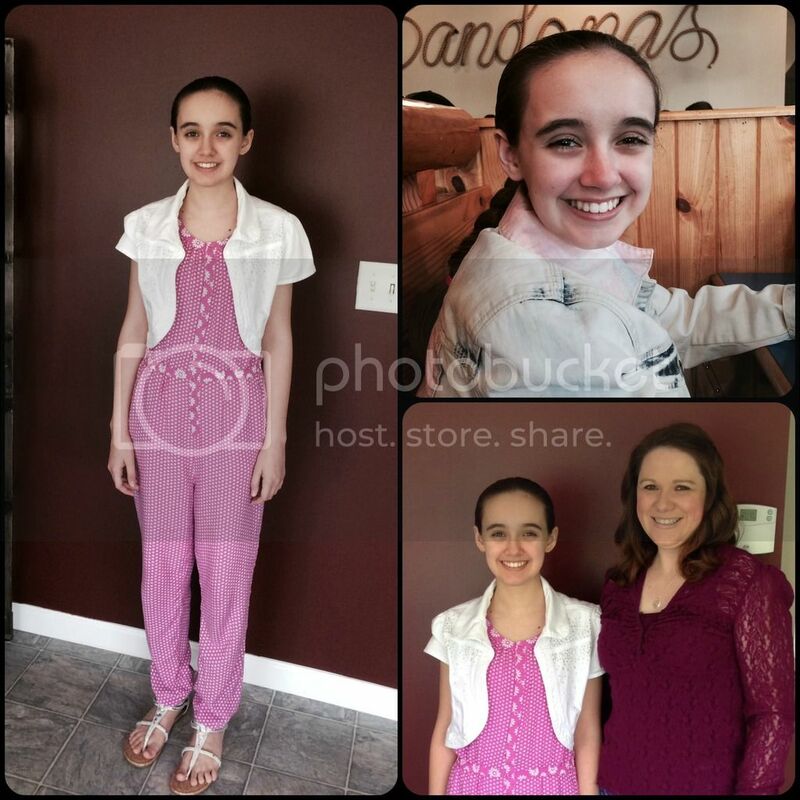 Tuesday, after Amber recovered, we walked the path around the swale to the bridge and over into the next subdivision. There is a ton of natural vegetation and trees back there along with animal life. Who knew? We should have since we've only lived in this house 9 years. We are officially the laziest and most unobservant people around. Amber selected a location to follow over the coming seasons and then began to document her spot. I got bored watching and walked up the edge of the swale (we were on the back side) just to realize we were *directly* across the street from our house. As in probably close enough that my puny girl arms could through a ball into my own yard. Again, pathetic. In History Amber has finished all her reading on Tudor and Stuart England along with the the timeline. She's really only got her writing assignments left and then history is finished! We do have plans to work on New World Explorers from Home School in the Woods over the summer. Instead of going in detail on the explorers during history this year, we saved them all for a summer study. She definitely could use her medication, but still persevered with school. And our three kitties in one place at the same time - birds were involved. Amber did also complete Geology this week, which makes 7th grade science officially complete as well. She asked earlier in the semester to be able to study chemistry too, so we have those books and will work on them over the summer before 8th grade physical science. Even though we do continue school over the summer it's pretty relaxed. We don't have full days of school during June or July, but we do try to complete one to two subjects per day. Some days we chose to just take off entirely and play video games all day long. It's not a hard rule that lessons must be completed every day over the summer. While Math is always one of the summer subjects, the others vary. This summer Amber will be working on a combination of math, chemistry, explorers, the last few morphemes lessons (if she doesn't finish by the end of May), and creative writing. Because of the review crew there may pop up a couple of unplanned summer studies, which are perfectly fine too. Since we limit each day to no more than two subjects, we can still review without feeling overloaded. Amber also completed enough of her lessons this school year to not be considered behind in any subject. That means nothing is required for summer in order to start 8th grade on schedule. Crash course at the allergist and Nature study day. (Right) Amber was taking a picture of her chosen area from up on the outside hill of the swale. Above Amber is a house peak - that's our house. Nature so close to us. Sigh. Switching to Life of Fred math has made Amber such a happy student again. I really didn't get how Saxon was affecting our whole school day. She dreaded math until it happened each day or until I told her she could skip math that day. Now she actually chooses to complete more lessons in math than I ask. She's averaging two lessons per day, with the occasional third lesson that balances with days when she's really only mentally up for one lesson. We've been working through an online math product too (CTC Math) that has been a good fit with LOF. Watch for a review of CTC Math in June. 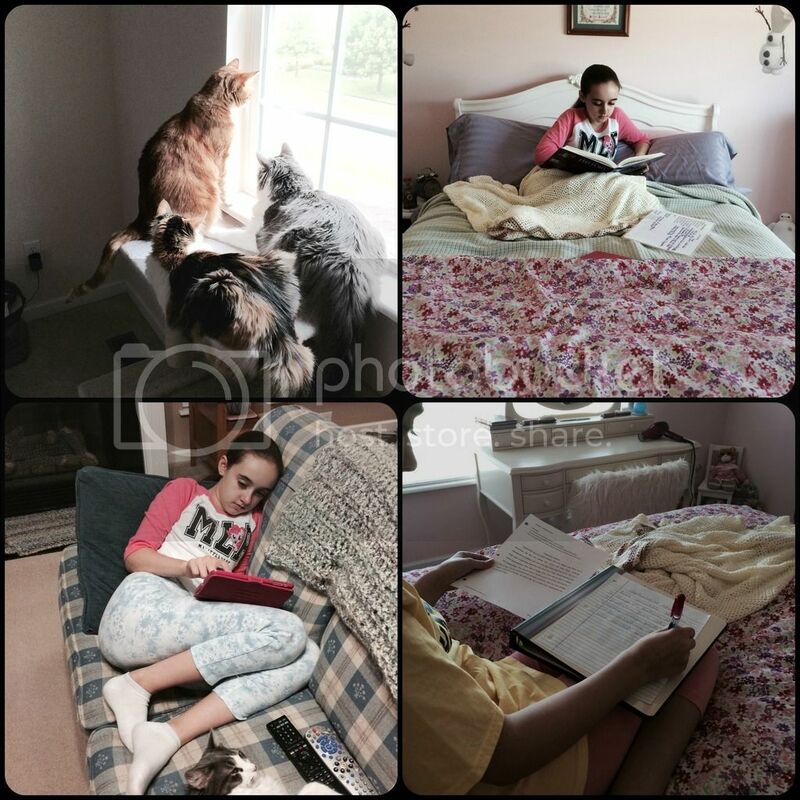 This week on the blog I talked about our favorite homeschooling resources for middle school. It was definitely time to update that list! Check out what we couldn't live without these days. This weekend we have nothing on the calendar and it feels great to know we can relax or work around the house as we please. I'm a little tired of the go-go-go from earlier this month. What a great week. We are in the same boat. We are done with required hours and only have some loose ends that I want to wrap up. That's so weird. My daughter, Rachel's feet turn purple when she stands up for a while, too. No doctor has ever figured out why. It has never really bothered her so we have just ignored it. Can you tell me more about that? Isn't it funny how we sometimes don't know what neat things are right there in our own backyards!! I'm hoping and praying that Amber continues to do okay until she can go back on her medication. You guys have an awesome week! Amber's feet turn colors from blood pooling due to poor circulation. There are lots of causes of poor circulation, Amber's happens to be low blood pressure from dysautonomia. Compression socks help. Thanks. I'll have to tell Rachel about the socks and check her blood pressure! Really happy to hear that your school year is coming to its end and that Amber is all set up and ready to go for 8th grade! I hope you girls are enjoying your weekend and being lazy! Sometimes the busy lifestyle can burn ya out so relaxing and lazy weekends can feel amazing! You still manage to cram so much into your weeks, even under tricky circumstances. I'm glad coming off the medication hasn't caused too many withdrawal symptoms. We've just finished using the Explorer curriculum - I hope you have as much fun as we did! We're doing Shakespeare over the summer and are so looking forward to it! Thank you so much for your mention of angelicscalliwags, I felt very honoured! Shakespeare! How fun. I can't wait to read about it. I am glad you are finished your hours and can relax a little. We have six weeks left to portfolio time. I am ready to be done. Going off medication looks to be really tough on her. I am confidant that the Mayo doctors will help a lot but I wish it wasn't such a rough ride for her. I like that you found nature in you backyard. I did read last weeks and you caused me to dig out my Rush CDs. I wrote this week's post with Rush in the background. The cheese 'Crackers' reminded me of a recipe. I have never made it but lots have. It is from a comic strip but it is similar to the cheese crackers. Our Rush tickets didn't sell in the time frame Stub Hub allowed, but Amber was way too sick to go. We were afraid to leave her and would not have enjoyed the concert. I ended up giving them to friends who greatly enjoyed the concert. It worked out for us all. I'll have to look at the recipe too!